Order is so much neater than chaos. Even better can be revealed order when something looked like chaos. The fact that there are stages to grief somehow offers structure and path when you’re in the throes of the experience. By the way, those would be 1) Denial; 2) Anger; 3) Bargaining; 4) Depression; and 5) Acceptance, though you may experience an additional two if you read the thoughts of other psychologists than Elisabeth Kubler Ross and David Kessler. Then, there are the numerous lists that people have developed to define the basic needs of human beings. These vary dramatically as some include oxygen and food while others include self-actualization. I’m not going to judge agendas here, so let’s just say that those lists also provide a structure for looking at life. If it helps, then utilize away. In the arts, order comes about from grouping things together. I’m not talking so much about what the artists does, as what happens after the fact of creation. Everyone in the art world gathers together and decides how they will classify what has been created. We do this by time period (Baroque, Classical), movement (Impressionist, Dadaist), material used (spray paint, ceramics), genre (mystery, comedy), etc. is that I believe this is the one thing that artists do think about when working. Nobody paints a ship without knowing that they’re painting a ship and that other people have painted ships. To some degree, you are aware that so-and-so achieved a nice effect by waiting until the sails were unfurled in the sunset. Or maybe it’s as simple as you liked other work that had multiple ships or ships in battle. No matter what, you’re not the first ship painter and it would have to be a pretty extreme delusion to believe otherwise. For writers, there are five or seven or just so many plots available. The distinctions probably lie in how close you get. Mountains (and plot points) disappear as you withdraw further and further. The interesting thing about the plot/structure of The Canterbury Tales is that it allows a writer to have their cake and eat it, too. Essentially, a bunch of people travel together and tell stories as they go. So, you have a quest plot, but you also have the plots of the individual tales. While that structure has been used to tie together short stories that had never really been unified previously, the real challenge is writing such a book with the same sort of intent in which each tale illuminates each other and the whole is improved by the way each story impacts the final work. 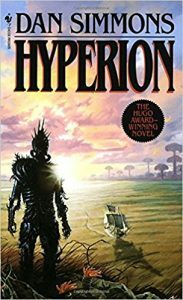 Hyperion is remarkably successful at this almost insurmountable challenge, which takes juggling into a realm of the imagination. The book’s power comes from the accumulation of everyone’s experiences, much as Chaucer managed. I would argue that it goes even further by finding intersections that shine a light on the themes of pain and loneliness and faith that are shared by both works. You’ve Got to Check This Out is a blog series about music, words, and all sorts of artistic matters. It started with an explanation. 40 more to go.